I think this is the right forum for this topic. 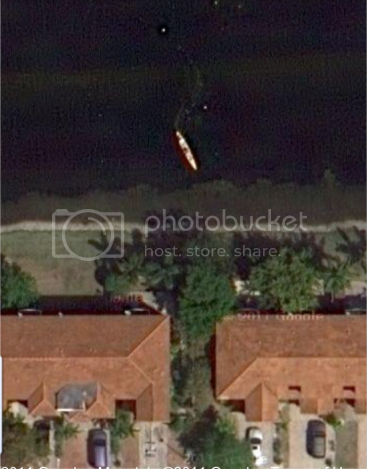 When playing around with Google Maps yesterday, I took a look at our townhouse property in Miramar, Florida - and what did I see in the lake? 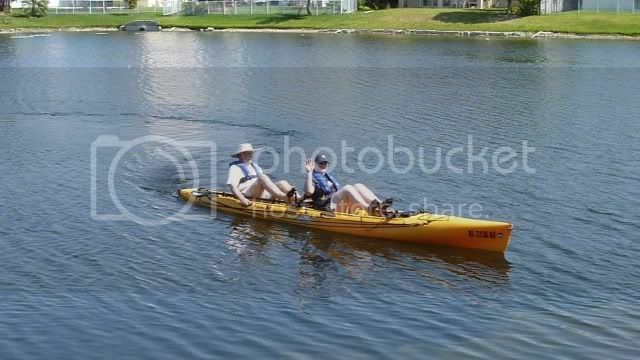 --- our Hobie Tandem Island [main hull only] on its maiden Mirage-driven voyage in Florida waters, March 27, 2011. I had purchased the TI from a nearby Maryland dealer in February, given it a "shakedown" sail on a Delaware lake during an unseasonably warm day in mid-March, and then towed it south during Spring Break. The Trailex trailer is visible at the bottom of the image, in the only only driveway not occupied by an automobile. Incredibly, I have another photo of the same event shot from a terrestrial point of view. Compare the "S" shape of the wake and the proximity to the shallow water at the edge of the lake... clearly the same moment in time. That's VERY cool! Especially the "S" turn! HaHa - that's awesome. 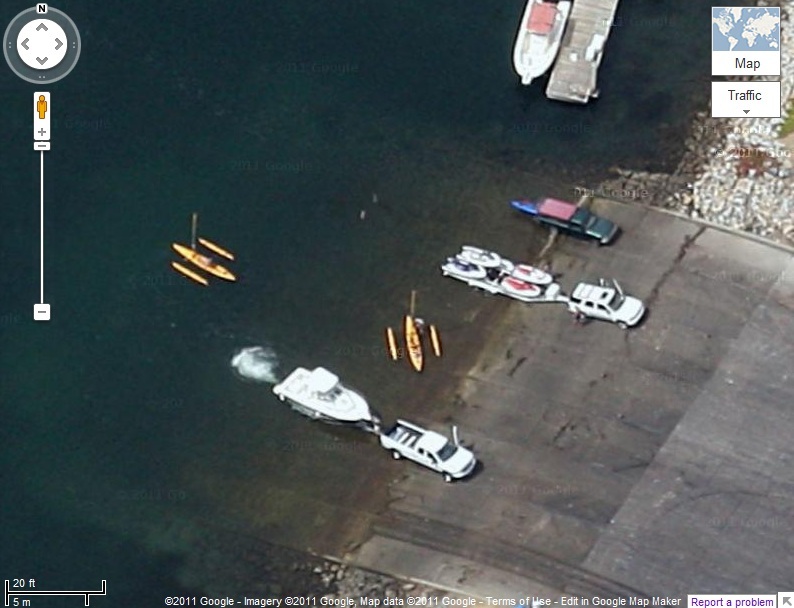 Gotta love that Google Earth. I recently saw one of their street view cars driving down my street. Nice Tandem Island!!! Big Brother is watching you and that is proof he is only interested in you. I'd have a hard copy of it framed. When ever nature called, until now, I never thought of looking up. Think of the bragging rights: "I'll have you know, my wedding tackle is visible from outer space!" Now we need to find all TIs on Google Earth. No chance of that here. Latest Google Earth images from my area are from June, 2003. Over eight years ago. Our entire neighborhood is not even on it. The latest images I have of our place from space were taken before the TI even existed. I live in a tropical time warp!! I guess the good news is that it means nobody's military is much is interested in this place. Extra points for the first AI/TI to be "Googled" under sail,.. They aren't sailing, but here are a couple that were recently spotted in Mission Bay in San Diego. Hoping it will be a RED one.